If you’re looking for beauty and comfort in a vehicle, the Nissan Murano was created with you in mind. Nissan created a distinctive vehicle with the first Murano in 2003 and they’ve aimed high for the all-new, third generation Murano that enters a much more crowded and competitive market for 2015. Nissan has a very specific demographic in mind for its flagship crossover, targeting empty nesters who will often go out on the town with another couple. The car is designed for adult passengers to interact with one another in a “social lounge” kind of setting, so attention was paid to the experience in the rear seats. Take a look at the slideshow above and you’ll see that this third-generation Murano looks like another design home run worthy of Nissan’s original model. 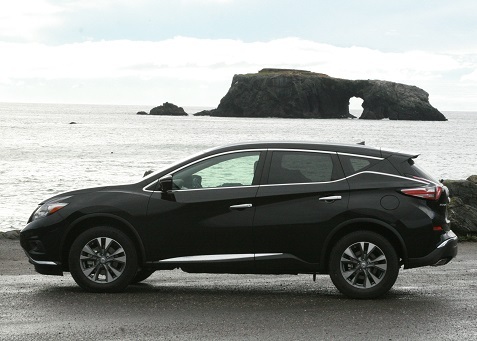 We drove the Murano from the heart of Sonoma wine country out to stunning Goat Rock Park on the Pacific Ocean. You can see the use of glass and the flowing lines of the compelling new design. Nissan stressed three key elements from the Murano that will show up in future designs – the V-Motion front end, signature lighting and the ‘floating’ roofline.” The roofline in particular stands out along with the boomerang-style headlights and taillights which were originally introduced on the Nissan 370Z. It all comes together beautifully in a package that will certainly appeal to the target demo. The new model also sports a 16 percent improvement in overall aerodynamics versus the previous generation design. Nissan stresses the comfort of the Zero Gravity seats and I can say again with confidence that these seats are very comfortable after spending many hours in the new Murano. The seats are standard for the front and rear and the rear seats are a new three-cushion design. Front seats feature heating and cooling with heating offered in the rear seats. The “social lounge” feel is achieved with several features, including what Nissan calls a “communication alley” created by the wide, low center console that makes it easier for occupants in the front and back to interact with one another. If you’re in the back seat, you can control the car stereo by hooking up your smartphone to the rear USB port. Nissan reduced the number of audio and navigation switches 60 percent from 25 to 10 for a more user-friendly experience and the Murano now includes a 7.0-inch high-resolution color display. Overall, the look of the interior measures up to the beautiful exterior, and offers an upscale and luxurious experience that many in the target demo will expect. The ride in the Murano is very smooth and quiet, and the crossover handles nicely. You’re not buying a vehicle like this for speed or performance, but it offers a very pleasant drive that makes it perfect for city driving or long road trips. The engine stays the same with the new Murano with a standard 3.5-liter DOHC V6 rated at 260 horsepower and 240 lb-ft of torque. Fuel economy is projected to increase by approximately 20 percent versus the current Murano after around 145-pounds of weight reduction along with the enhanced aerodynamics and engine/transmission efficiencies. Murano offers much of the technology you’d want in a luxury vehicle, with up to four cameras (front, rear, two side) and three radar sensors (one front, two side) to features such as Blind Spot Warning, Predictive Forward Collision Warning Forward Emergency Braking and Intelligent Cruise Control. It also features a new Rear Cross Traffic Alert system and an Around View Monitor with Moving Object Detection gives the driver an all-around view of the surrounding area from front, rear and side cameras. This can be a huge help with parallel parking and also gives the driver a view of the vehicle’s placement in pull-in spots, garages and against curbs. The 2015 Nissan Murano is offered in four grade levels: S, SV, SL and Platinum and each is available in front-wheel drive or all-wheel drive. The design alone should attract plenty of attention in the target demo and among buyers of other ages as well. We expect the new Murano to perform very well with consumers in the competitive crossover market.